Spring has Sprung and so have the cake pops! Read more to find a few suggestions on how to make these pastel pops that are also dyed in the middle! Mix your ingredients to make your cake as you normally would. I would suggest using a white cake so that when you add the food coloring it will come out the true color. To bake my cake I put the batter in a cupcake pan. After that don't forget to dye your icing also. For that it will be about 1/3 cup of icing. Dye your icing add to the cake and roll as normal! I decided I wanted to use only one cake but make three different colors. I found that using a standard cake mix it will be about 2 1/2 cups of batter and they will come out evenly divided. Then after you have frozen them for about fifteen minutes, dip them in your candy coating and coat immediately with the coordinating colored sprinkles! For decoration put them in a planter! These are so pretty. 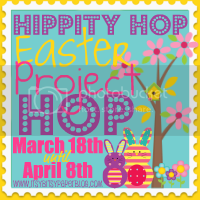 I hope you will link them up to my Hippity Hop Easter Project Hop.